If you have trees removed from your property or are considering going the DIY route with your tree removal. Are you remembering the WHOLE job? Cutting down and removing a tree is only part of the job and perhaps maybe even the easiest part. At Mr. Tree and Lawn Service in Gainesville we don’t just trim and remove trees, we are tree removal professionals who complete the entire job including removing the stump. Removing the tree takes care of one problem but still leaves you with another one. Leaving the stump after a tree has been removed can be a safety hazard, is unsightly, will eventually rot and can attract insects. 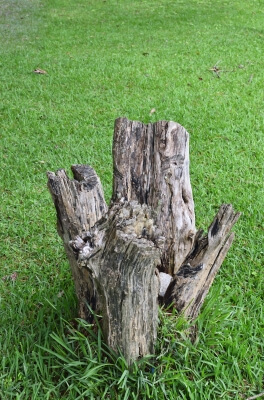 If you are living in a property where someone else has removed a tree and left the stump let us give you a few don’ts in case you are considering removing it yourself. Hook the stump to the back of a tractor or car; get a running start and try to yank it out of the ground. This could pull the bumper off the car, damage the brakes or the axle or worse yet, you could lose control of the car and hit someone/something. Tractors could be pulled over backward, flipping on top of the driver. This has indeed happened to people, causing injuries or death. Using dynamite. Yes, there are people who still try this. Don’t. It’s illegal and using explosives is only done with a special license. Mr. Tree and Lawn Service is the go to source in the Gainesville area for all you tree trimming and removal needs including stump removal. We are professionals in the field with years of experience to provide you with professional tree services. Call us at 352-682-4444. Or use the convenient “Contact” feature on our website.